Here's a great way to show your appreciation for guys in the armed services, policemen, firefighters and other occupations where uniforms are the daily attire. Or does it refer to Santa? The I love a man in uniform Christmas ornament lets you decide. It's one of our fun and flexible holiday ornaments that works for lots of people on your gift list. 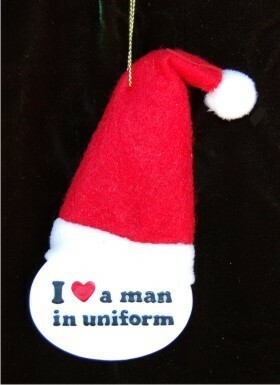 Hang up the I heart a man in uniform Christmas ornament for Santa or for someone special in your home this season.